The first day of July 2018 saw the activation of the smoke-free policy at The University of Queensland (UQ), a policy that applies across everything UQ from campuses to vehicles. The ban was introduced in accordance with an initiative by Queensland Health that involved ensuring university and TAFE campuses across Queensland were smoke-free. While this policy was seen by many as a positive step, it was met with opposition from the UQ Union (UQU) who launched an appeal against the policy. The appeal was set in motion because the UQU believed there to be significant flaws in the policy, some of which they argued would expose students to unnecessary dangers. Jeremy Lwin, President of the UQU, spoke to JACdigital about the ban. Mr Lwin went on to explain the main danger of forcing people off campus to smoke was that it would allow people to prey on them. He did concede the UQU didn’t have any concrete evidence to support the claim, but that it’s common sense. However, concern over student safety was not the only reason for appealing the ban. According to Mr Lwin, the UQU council agreed the ban disproportionately affected people from low socio-economic backgrounds. “Some of them have had bad upbringings and abusive parents… there are all sorts of reasons people smoke,” said Mr Lwin. There has been speculation that one of the main reasons for introducing the ban was to lower the university’s insurance. Mr Lwin was quick to say that he did not believe that to be one of the main motivations for introducing the ban. The University of Queensland was one of the last universities to introduce a ban. However, UQ’s ban has come under fire from students for being unenforceable, a view in line with the UQU President. 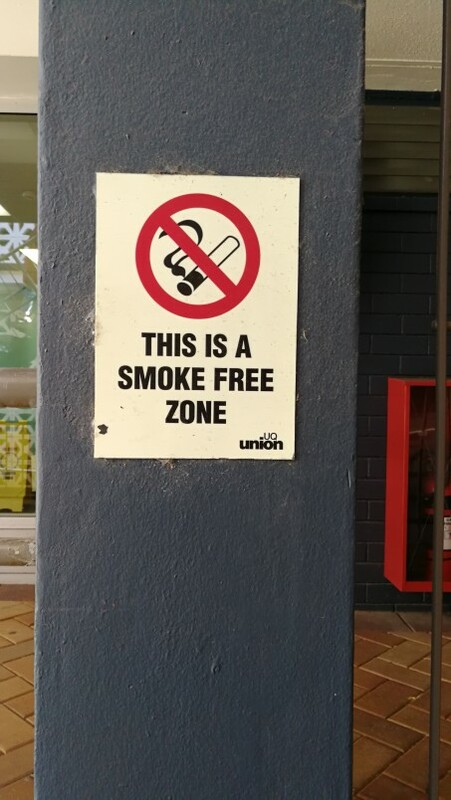 An example of one of the signs around the UQ Union complex at St Lucia, indicating that union spaces are smoke free. UQ Union spaces have been smoke-free for several years according to the UQU President. When asked about the potential safety risks posed to students, the university says they advise all UQ staff and students who leave campus to smoke to go somewhere safe, well-lit, and not remote. The university went on to highlight the dangers of smoking and passive smoking. “Tobacco smoking is a leading cause of chronic diseases such as cardiovascular disease, chronic lung disease and many cancers. The university disagreed with the assertion that the smoke ban disproportionately affects students of lower socio-economic backgrounds. The University of Queensland says smoking and exposure to second-hand smoke can cause significant harm and views it as their duty as leading health research to ensure university policy promotes wellness among staff and students. An example of the many banners that the University of Queensland has around their St Lucia campus to notify students of the ban. Some students were upset with the introduction of the smoke-free campus policy, taking to a popular online forum for UQ students to express their feelings on the ban. Some students, however, were in favour of the ban saying it made the university healthier for everyone. The overwhelming majority of students discussing the issue online were vehemently against the policy. 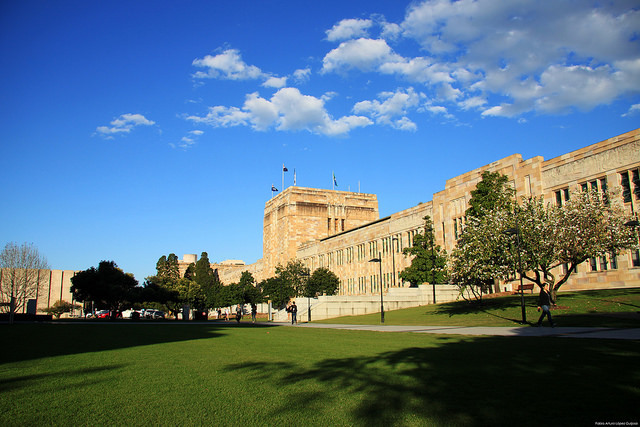 However, they are only a very small percentage of the UQ population and their views do not necessarily reflect those of the majority of UQ staff and students.